On the windy evening of January 4, 2017, 33-year-old Muhammad al-Hissi of Gaza set out with 13 of his brothers, cousins and uncles to make a living the only way they know how: fishing. But he never came home. The family was spread out in three different boats, with the waves choppy and stiff, when the Israeli Navy appeared on the scene. The 60-ton ship rammed into Muhammad’s wooden boat and crushed it like a rock on an egg. Palestinian fishermen and the Israeli navy searched for Muhammad for three days, but his body was never found. The boat’s electric generator may have dismembered his body. Muhammad was one of two Palestinian fishermen killed by the Israeli navy in 2017. Four others were injured, 14 were detained and five boats were seized. However, shootings at Gaza fishermen by the Israeli navy are daily occurrences, terrorizing and forcing many to abandon the sea. This pattern is set to continue into the new year, with the recent decision by Israeli officials to restrict Gaza fishermen to 6 nautical miles instead of the recently allowed 9 (only in the southern coast). Help us shine a light on this violation of the right to earn a living. 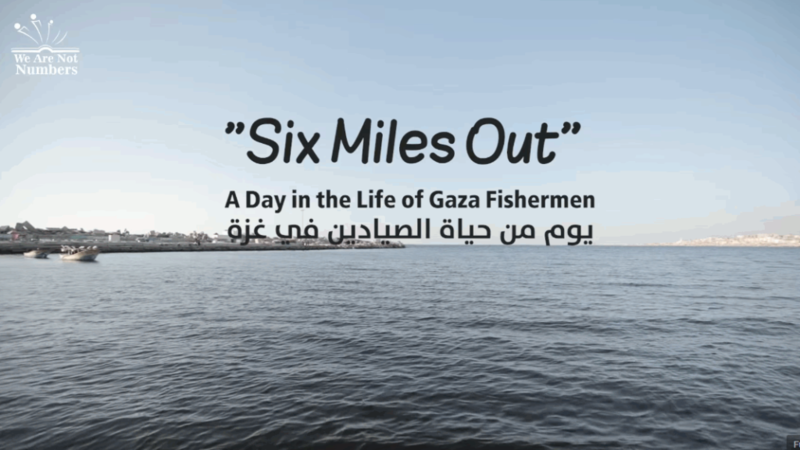 A new, short documentary, “Six Miles Out,”—produced by the We Are Not Numbers team in Gaza, with funds from the Solidarity with Gaza Fishers project of the Freedom Flotilla Coalition—features al-Hissi’s brother and cousin, who take us with them for a night of fishing. You will see for yourself just what it’s like when Israeli “hornets” suddenly appear on the scene. Please share this 11-minute film on social media with a personalized observation. Send a link to your followers via email (this is actually the most effective). The film is subtitled in French, Spanish and Greek (use the the Youtube “gear” icon near the bottom left to turn on different languages). What can viewers do to help? They can donate to We Are Not Numbers, a Gaza-based youth storytelling project, to keep its work going. They also can visit the Freedom Flotilla website to find out how to support the 2018 sailing to challenge the blockade of Gaza’s seaport. Gaza is at war with Israel and it’s not just rockets and terror tunnels. Hamas regularly uses fishermen to smuggle weapons and other military equipment into Gaza. A beautiful and profound video. I’m deeply saddened and angered about Israel’s senseless cruelty towards innocent fisherman. I’m positive that anyone of above average intelligence, sound moral character, and who possess basic humanity, would similarly be moved.